Like Popeye downing a can of spinach, the Minnesota Twins loaded up on power this offseason. The team made four major additions to its offense, claiming C.J. 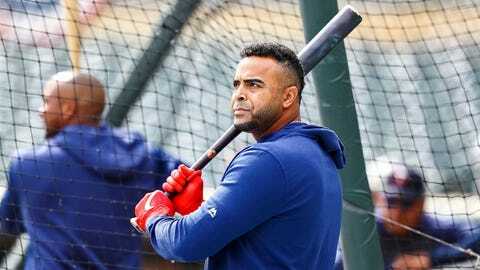 Cron off waivers and signing Nelson Cruz, Marwin Gonzalez and Jonathan Schoop in free agency. Those four players accounted for 104 home runs in 2018 (Cron 30, Cruz 37, Gonzalez 16 and Schoop 21) — easily the most of any team, based on opening-day rosters. Philadelphia added 85 homers to its roster, based on last year’s stats, Seattle 69, Cleveland 55 and San Diego 54. In other words, the Twins added more than double the HR power than the majority of MLB teams. It’s a little surprising then that the Twins have hit just one home run in their first three games. Just two of Minnesota’s 12 runs thus far have come via the longball (a Cruz dinger Sunday). The 16.7% rate of runs scored via a home run is sixth-worst in the majors — Kansas City, Minnesota’s opponent Tuesday and Wednesday — has yet to leave the yard. But that’s also good news for the Twins. Because you know the power is going to come, not only from the four above-mentioned players but also Max Kepler, Eddie Rosario, etc. And if Minnesota can win two of three games without flexing its muscles … well, imagine what can happen once the balls start flying out of the park. — Pitching is ahead of hitting, for the most part, all around the majors, but especially so in the American League. The average slash line in the AL is .218/.299/.37-. The Twins are just below that at .231/.304/.385 — put them sixth in batting average, fourth in on-base percentage and sixth in slugging percentage. — The Royals are hitting .219/.296/.323, also in three games. — Jose Berrios tossed 7 2/3 shutout innings in his first start. Last season he began the year with 12 straight scoreless innings, tied for fifth-most by a Twins starter to begin a season since 1974. The best over that span is 17 1/3 by Andrew Albers in 2013. Fernando Romero went 15 2/3 innings to begin his MLB career in 2018. — Kansas City’s Brad Keller pitched seven scoreless in his 2019 debut. Since the 2018 All-Star break, Keller is 8-2 with a 2.79 ERA, .240 opponent batting average and 1.18 WHIP. Over that same span, every other Royals starter is 17-18 with a 4.57 ERA, .266 OBA and 1.32 WHIP.